Dia duit, agus fáilte go Imbas Creation; an ealaín Cheilteach le Ingrid Houwers. 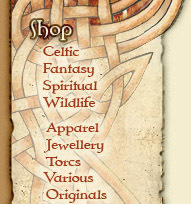 Hello, and welcome to Imbas Creations; the Celtic artwork of Ingrid Houwers. On this website you’ll find a choice selection of the artwork by Ingrid Houwers, one of the leading Celtic artists in Ireland, to view and buy, together with information about her and how to contact her. From fine art prints, to jewellery, apparel items to full custom work. If you’re looking for an original gift for yourself or for someone else chances are you’ll find the perfect thing right here. And if it isn’t in the shop, you can always contact us for that special commission. Either way, we hope you’ll enjoy your stay here!